The legends, myths and unique history to the Camino de Santiago de Compostela are many. Just like an onion as you keep peeling more is revealed. Each area, every route of the Camino, and every century layer upon layer you can keep discovering different aspects through its many stories, ancient architecture, the culture and traditions that surround the pilgrimage. It is a treasure hunt or journey that once begun will never end. Its magic and mystery keeps drawing us back or deeper into the experience always increasing our desire to explore, discover and learn more of its hidden treasures. One interesting myth and legend is that of the LEGEND OF THE PILGRIM SHADOW. Throughout history people have shared this story and passed it down through the ages adding to its mystique that a shadow accompanies a pilgrim during the long journey to Santiago de Compostela. 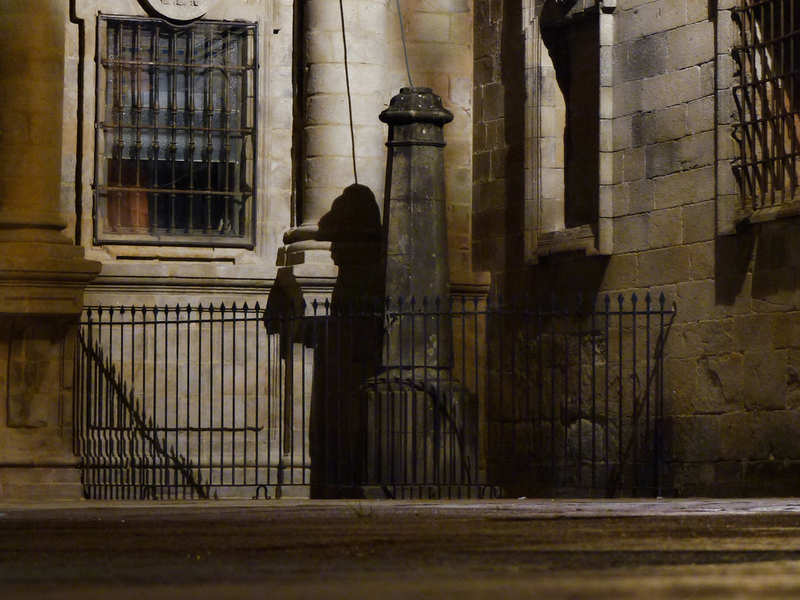 That this presence can be felt especially during hard sections but there is only one place that a peregrino can meet this shadow and that is in Quintana Square just outside the Cathedral. The shadow reborn when night falls and the lighting of the square you can see at the base of the clock tower, next to the Holy Door. For many images depict the shadow in medieval dress, hat and bread. Though this expression of a more earthly pilgrim may be due to the reflection created by the night lighting of the basilica and its granite pillars. Its origins are varied as some believe that it contains and reflects the soul of a pilgrim who stayed forever in the Cathedral. Others say that they recall seeing a figure of a French pilgrim of the fifteenth century, Leonard du Revenant, the son of a nobleman of Paris, who suffered a sad fate. The most widely believed version relates to the tragic path of a priest of the Cathedral, in love with a cloistered nun of the convent of San Paio, located across the square from A Quintana. Legend says that the priest met her through a passageway that existed under the steps of the A Quintana plaza and that they connected the cathedral and the monastery and this is how they met. Tradition of the story says that after awhile the priest tired of the situation proposed to his beloved and suggested that they escape together. He waited for her in the square with medieval pilgrim clothing that would provide secrecy. He waited patiently but she did not come. Still, night after night, the lover – or shadow – went to wait in hopes that she would come to meet him – and so now he still waits. This entry was posted in Secret Treasures , Legends & Myths of Galicia and tagged architecture, Camino de Santiago de Compostela, Camino Gratitude, culture, Inspiration, Legends & Myths, Legends and Myths of the Camino de Santiago de Compostela, outdoors, Secret Treasures of Galicia, spirituality, The Legend of the Pilgrim Shadow, The Way, The Way of St James, traditions, Travel. Bookmark the permalink.